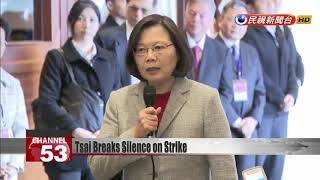 President Tsai Ing-wen has broken her silence on the China Airlines pilots' strike. Today at a business event, she appealed for the pilots and their employer to engage in "sincere" and "rational" negotiations. She also made it clear that her administration was taking no sides. Observers note that the president's message stands in stark contrast with her sympathetic response to striking flight attendants in 2016. At a Spring Festival business event today, President Tsai publicly addressed the ongoing pilots' strike for the first time. The administrative team is keeping a close eye on the developments in this case. Premier Su and I are also very concerned about this issue. We hope all parties can sit down with sincerity for thorough negotiations, showing flexibility and rationality to achieve a triple win. The president's neutral statement cuts a contrast with her stance back in 2016 during the last China Airlines strike. There isn't a single flight attendant who would go on strike for anything other than enduring the unendurable. We will walk along this road with every one of you. When the flight attendants went on strike in 2016, President Tsai had only been in office for a month. More than once, the president indicated that her sympathies were with labor. This time around, she remained silent for several days before finally calling on both parties to negotiate. It's clear she's not taking sides as her administration attempts to defuse the situation.